The 19th Ward is one of the most diverse neighborhoods in the country. We want our community association to be representative of everyone in the neighborhood! We encourage people of all racial and ethnic groups to join the association; whether young or aged, homeowner or renter, we need you! Be a Good Neighbor, Get Involved! 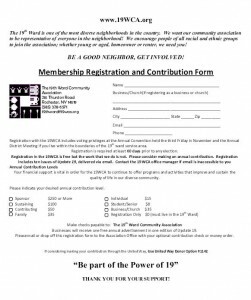 Registration with the 19WCA includes voting privileges at the Annual Convention held the third Friday in November and the Annual District Meeting if you live within the boundaries of the 19th ward service area. Registration is required at least 60 days prior to any election. Registration in the 19WCA is free but the work that we do is not. Please consider making an annual contribution. Registration includes ten issues of Update 19, delivered via email. Contact the 19WCA office manager if email is inaccessible to you. Your financial support is vital in order for the 19WCA to continue to offer programs and activities that improve and sustain the quality of life in our diverse community. Download a PDF and mail your Membership Information. Now you can even fill out the form online. Click on the link below that will take you to the sign-up questionnaire.